The cold days of April have been dominated by northerly winds from the Arctic and snow on high ground, even far to the south. 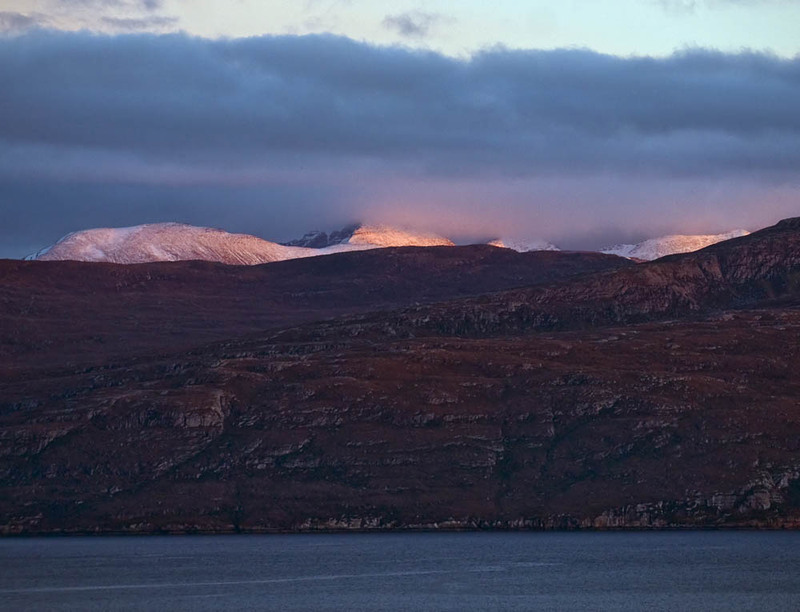 The great peak of An Teallach, one of the most magnificent of all Scottish mountains, catches the last rays of the sun dropping below the western horizon beyond the Outer Hebrides, in this view across Loch Broom from Culnacraig. The daffodils are fully out in the garden, and the primroses are at their best in the deep waterfall gorge of the Allt nan Coisiche on Ben Mor Coigach. Spring in the Highlands is unpredictable, but always exhilarating as the days lengthen, the first green buds appear on the trees, and the wildflowers begin to blossom on the mountains. Fine days can bring strong sunshine, and beautiful days free from midges.